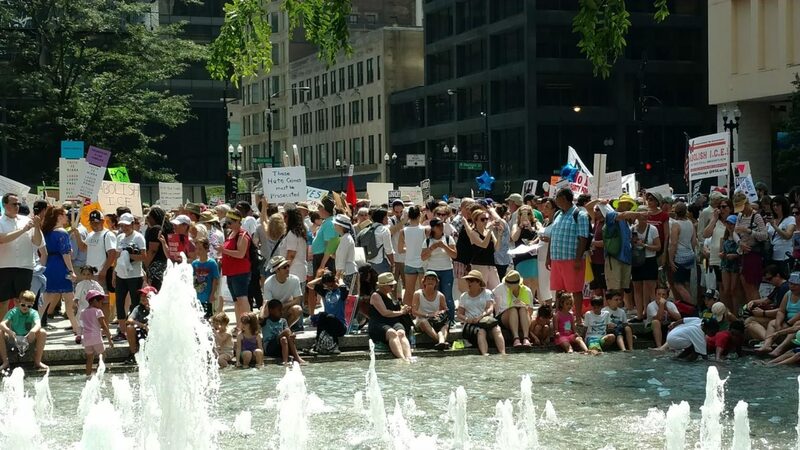 On Saturday, June 30th, YWCA Evanston/North Shore staff and community members stood in the scorching heat, alongside 50,000 others, to protest the cruel and inhumane treatment of immigrant families, women and children by our federal government. In solidarity with those attending over 700 demonstrations across the United States, we raised our voices against the many abusive immigration policies imposed by the current administration. Immigrants fleeing violence, war and poverty – in search of opportunity, safety and community in the United States – have been a target of the current Administration since its first days. However, over the last several months the Administration has taken special aim at immigrant women and children. We’ve heard quite a bit about the “zero tolerance” policy, the separation of families, the caging of children and adults in warehouses, and the inhumanity of it all. And even though an Executive Order was issued that requires children be kept with their parents in immigration detention while parents are prosecuted and/or their immigration cases resolved, there is still no comprehensive plan for family reunification. Nor does the recent Executive Order do anything to address the larger issue of the criminalization and incarceration of immigrants. The Order includes no plans to address the certain trauma incurred by these children, nor does it plan for their rehabilitation. On Saturday, rallying cries rang out through Daley Plaza, and at community protests in Glenview, Highland Park and Downers Grove, as protesters held signs showing small children behind barbed wire that read “Families belong together.” The YWCA was present to raise awareness about this and the many inhumane immigration policies being pushed through and practiced by our current administration. We were there on behalf of all survivors. We urge you to take ACTION now. And an investment in a comprehensive treatment plan to address the lifelong negative impacts of the trauma and harm cause to children and families.